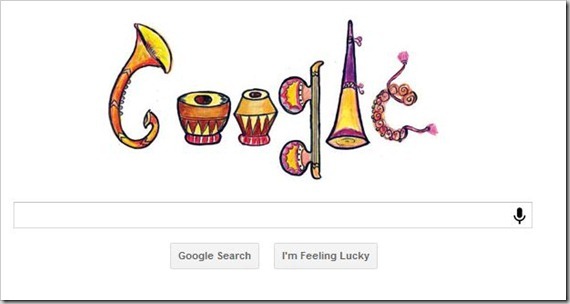 Google features “Indian Musical Instruments” Doodle on homepage created by Indian student ! Google has featured the “Indian Musical Instruments” Doodle on its homepage today on occasion of Indian Children’s Day! This Doodle created by 7 year old Indian student, Varsha Gupta, was chosen as the winner amongst over 1.5 lakh entries received by Google for the Doodle4Google contest which is in its 3rd year now! The Doodle4Google contest, announced couple of months back, had the theme – “India’s Gift to the world”. Out of the 155,000 entries received for this contest, only 45 entries had been chosen (15 in each category) by panel of eminent judges from the art and media fraternity. Online public voting was done to choose the winner, which, in the end went to Varsha Gupta, A Ryan International student from Delhi. Varsha Gupta’s doodle of the Google logo artfully depicts how India is a land of different cultures and music plays an important role in it. The doodle artfully represents many musical instruments that India has introduced to the to the world – Tabla, Sarod, Veena and Shehnai. Apart from millions of eye balls and world-wide coverage, the winner got a technology starter package that includes a laptop, a year’s Internet connection and a Rs. 2,00,000 technology grant for her school. Hearty Congratulations to Varsha Gupta and her school – And yes, A very Happy Children’s day to all the kids! Indian Airline woes: Not a case of Food poisoning, but Bad eating habits !